Struggling to talk on the phone due to hearing loss? Check out our line of amplified phones, phone amplifiers, captioned phones, and office solutions. Perfect for the deaf and the hard of hearing. This Amplified Corded Speakerphone is loaded with helpful features that will make it a welcome addition to any home or small office, and which will be especially appreciated by seniors and those who have mild hearing loss and difficulty seeing and dialing the numbers on standard telephones. Not only will you hear the phone ring, you'll see it too. When the phone rings, the ON-OFF button flashes bright red and ring indicator on back of phone flashes bright red. You're sure to enjoy the adjusting volume and volume plus features that go from loud to superloud for clear, easy listening. 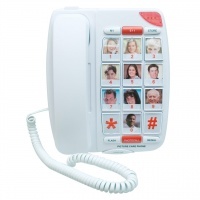 Talking Caller ID Speaker Phone with Large Buttons - This Talking Caller ID Speaker Phone is a versatile corded desk or wall mountable phone that delivers great functionality at a very reasonable price. 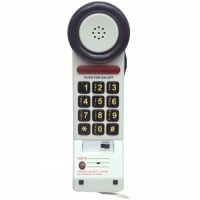 Ideal for those with low vision, this big button, talking phone makes contacting your friends and family a breeze. 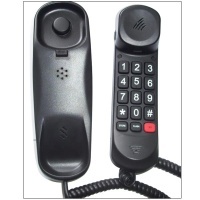 With this talking phone, you can rest assure you pressed the right button for convenient and quick dialing capability.